This product met all ingredient quality standards and recorded 1500 mg of l-arginine per serving. Contains absolutely no fillers of any kind. OU kosher. Hypoallergenic. Gluten-Free. non-GMO. Pure. Highest quality. NutraBio 100% Pure L-Arginine brings a super clean arginine ingredient formula to the table. No other extra random ingredients in this formula. Promotes better muscle endurance, bigger muscle pumps, blunts fatigue, and boosts muscle power. Profile: Pretty straight forward with no supersizes. 1,500mg of l-arginine in every scoop. Taste: Clear, not grainy, mixes easily. Supplementation is very simple and easy. Effectiveness: Highly effective, no proprietary blends, and the focus, muscle pumps, and endurance this product provides will satisfy any user looking to supplement arginine. 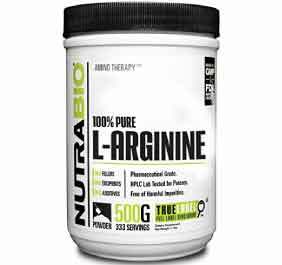 NutraBio 100% Pure L-Arginine is definitely one of the best pure arginine supplements on the market.